Cracking open a safe under the watch of a CIA gunman. Sherlock had a wildly successful first season, so it was only natural that the BBC greenlit a followup season chronicling the titular detective’s (Benedict Cumberbatch) struggle against master criminal Jim Moriarty (Andrew Scott). Once again, the season of Sherlock was made of 3 episodes, each approximately 90 minutes long. As before, Steve Thompson, Steven Moffat, and Mark Gatiss demonstrated themselves in their ability to write as all three episodes were perfectly paced; there wasn’t a single moment where I actually got bored with the show’s progression. Not only was this second season well-written, but it was also very well-executed. 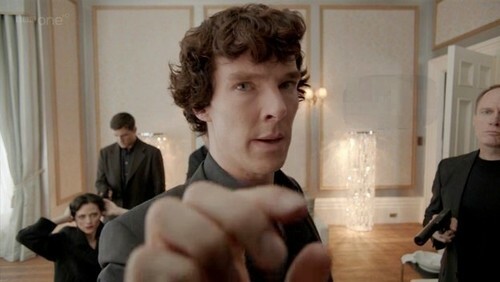 Benedict Cumberbatch once again did a terrific job as Sherlock Holmes as did Martin Freeman as John Watson. The performance that really drew me in, however, was that of Andrew Scott as arch-nemesis Jim Moriarty; let’s just say he wasn’t quite like Jared Harris in Sherlock Holmes: A Game of Shadows. What also makes a return is the very stylish direction from the first season. Showing text explicitly showing a character’s thoughts can come off as being very gimmicky, but it worked well for Sherlock. It is surprising how much the show relied on special effects, but they worked really well. Overall, there really isn’t much to say because the second season wasn’t really much different from the first. In this case, however, that is a good thing as the first season was a very good one. Sherlock once again demonstrated itself to be a fresh take on the classic literary detective conceived by Sir Arthur Conan Doyle. A very mild annoyance I had were that while the episodes “A Scandal in Belgravia” and “The Reichenbach Fall” were part of the main “plot” of the series, “The Hounds of Baskerville” was more of a “filler”. Still, that was a very mild annoyance and is no reason to ignore this series.